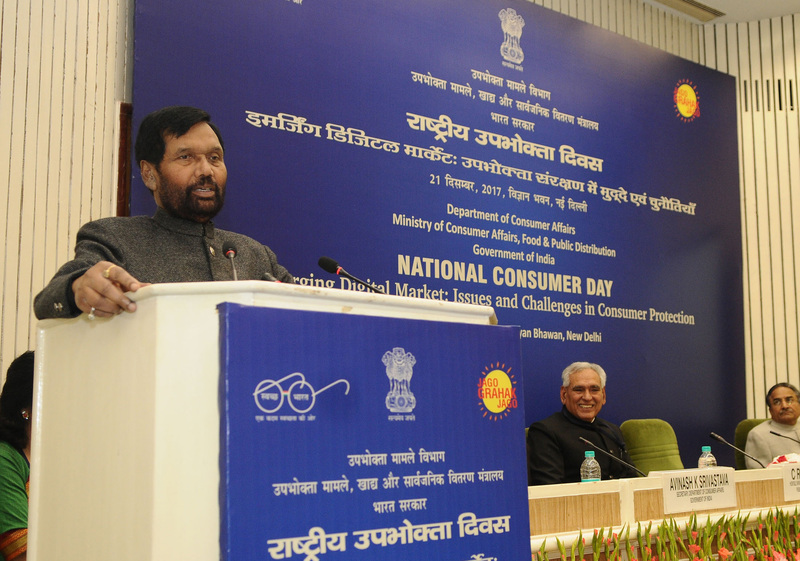 The Union Minister for Consumer Affairs, Food and Public Distribution, Shri Ram Vilas Paswan addressing at the inauguration of the National Consumer Day 2017 celebrations, in New Delhi on December 21, 2017. The Minister of State for Consumer Affairs, Food & Public Distribution and Commerce & Industry, Shri C.R. Chaudhary is also seen. NewDelhi : The Union Minister for Consumer Affairs, Food & Public Distribution Ram Vilas Paswan today said that the new Consumer Protection Bill has been approved by the cabinet and is likely to be introduced in the present session of parliament. Shri Paswan said that the enactment of BIS act 2016 and Consumer Protection Bill are historical events in the history of consumer movements. In his presidential address on the occasion of National Consumer Day 2017 with the theme “Emerging Digital Markets: Issues & Challenges for Consumer Protection” organized by Department of Consumer Affairs at Vigyan Bhawan in New Delhi today. The Union Minister further stated that exiting Consumer Protection Act enacted in 1986 is 31 years old. Meanwhile, the whole scenario the market has changed. No one imagined that smart phones will become a complete world in itself and the future of the digital world in the next 25 years is also not predictable. Paswan mentioned that Government has embarked on modernizing the legislation on consumer protection to keep pace with the changes in markets to ensure fair, equitable and consistent outcomes for consumers; and to enable swift executive intervention in the nature of the class action to prevent consumer detriment. He commented that this is the age of technology, and educating the consumer and redressing his grievances in the digital world is important. The Union Minister stated that digital literacy and financial literacy should go hand in hand so that in a cashless economy envisioned by the government, consumers are skilled enough to use digital payments system and confidently use various financial products.